Destructive tests of this manner are NOT recommended as standard test cutting exercises. 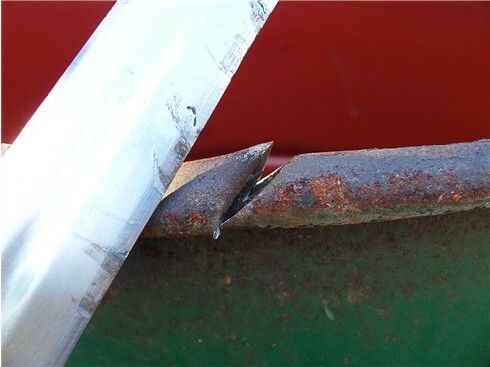 These tests were conducted after careful examination of the swords structure and blade geometry to determine probable breaking points. 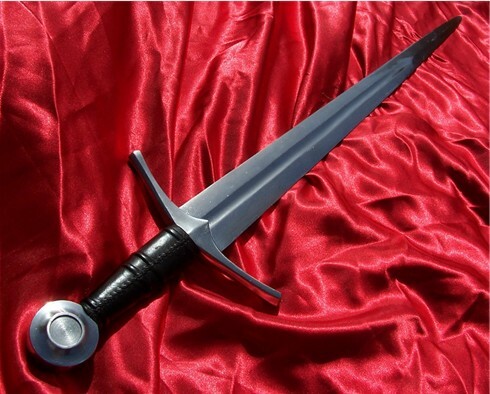 Historical swords were designed primarily to cut human flesh and bone, with a little extra to deal with secondary unintended targets like shields, armor, etc. Breakages in battle were commonplace and if you attempt to recreate these tests, no manufacturer in their right mind would cover you for damages! 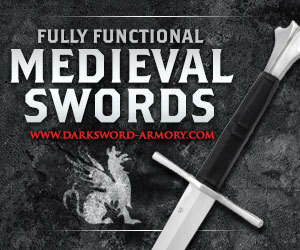 The Darksword Armory Knight Sword Destructive Testing was first conducted in late 2007 when this brand was first brought to the forefront of my attention by my friend Jason Woodard. 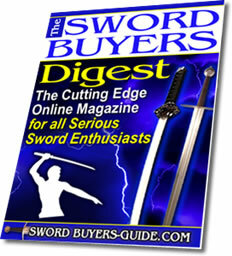 The reason for these swords durability is the choice of steel (with .60% carbon content, ideal for 'beaters') and the overall build of the blades and components, which have been refined and improved over the years (Darksword Armory have been making swords since 1996, but massive changes started soon after we got the word out with these very tests). The subject of our testing is the 1306 Medieval Knight Sword. Here it is before the testing began. 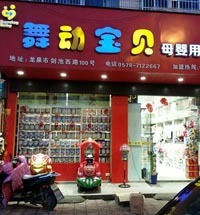 This was my first sword by this brand. And as always when I encounter a new brand (or at least, new to me) I have to push it to the edge of it's limits to get a true idea of what it is really about. Going into the knight sword destructive testing, I already had some indications that it would probably perform quite well. 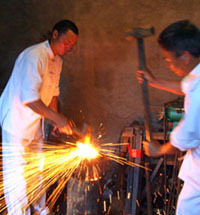 I had already given it a good once over, flex tested the steel, sharpened it and used it for some cutting. You can see the full review here. 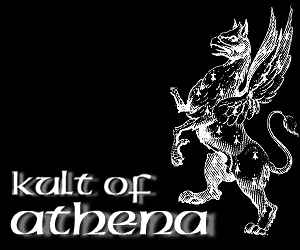 But I had also seen some destructive testing by the owner of Darksword, Eyal Azerad, thrashing the heck out of a heavy duty Gorilla Brand steel shelving unit..
Of course, his testing was done with the sword un-sharpened. I had sharpened mine up, so with a more fragile, narrower edge my knight sword destructive testing should cover all the bases and push the steel, and the sword, further than ever before..
For the first test, the Knight sword was subjected to a plank of wood (or rather, the plank of wood was subjected to the Knight sword!). This would determine both its overall structural integrity as well as the ability of the newly sharpened edge to withstand rolling. The blows were not extremely hard, but hard enough to bite much deeper than expected – both against and with the grain. 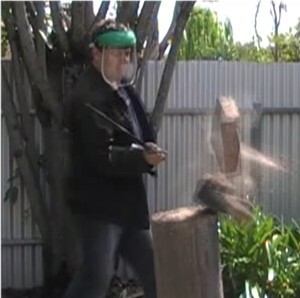 As you can see from the video, blow after blow chewed the wooden plank up in short order – and the blade itself showed no marring, rolling or loss of hilt integrity. So much for the easy stuff: it was time to try out some similar tests to what Eyal had done to the Gorilla Shelving for myself. 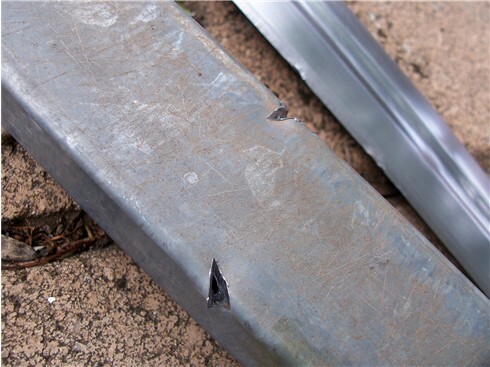 But this time, with a wood splitting sharpened edge..
As such, the next target for the knight sword destructive testing was a thick length of galvanized steel tubing..
To get a general feel for the steels durability, I laid the tubing down on the ground and gave it a whack with an axe. Then I set the steel tube up by clamping it to my cutting stand and gave it two decent hits. The first strike equaled the damage inflicted by the axe. But the second one went deeper. After each strike, I examined the blade. The Knight sword suffered some expected denting to the edge, but no rolling and certainly less deep than I have seen on other medieval swords subjected to the same test. 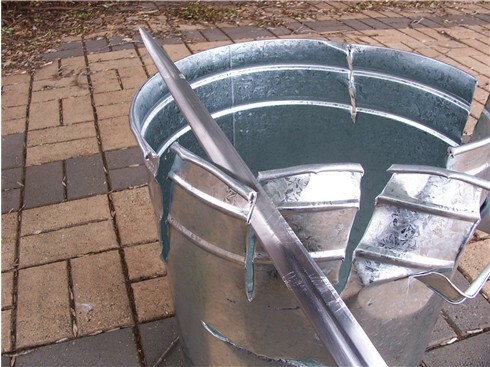 Satisfied, I moved on to another target – a galvanized steel bucket and lid. The first test was conducted by placing the lid within some wire mesh on a tree and thrusting into it. 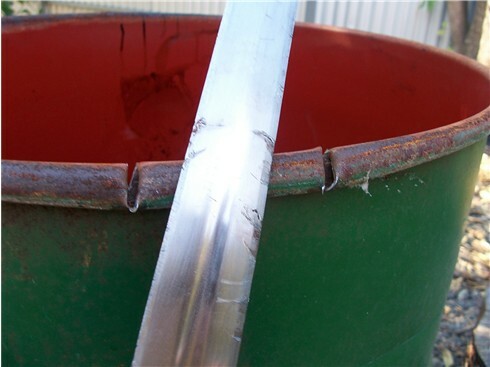 The galvanized steel offered zero resistance – the blade passing right through and the tip going deep into the tree. 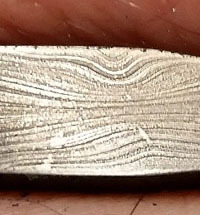 Considering that I had barely shaped the tip to a decent point, this was extremely impressive – leaving behind a clean imprint of the lenticular tip that was characteristic of a Type XIV Knight sword. From here, I proceeded to deliver a series of downwards strikes into the bin itself. I was uncertain as to whether the edge I had created would be enough to cut through the lip of the bin. But I needn’t have worried. Each cut went pretty much half way through the bin. As you can see in the video, a horizontal strike opened the can right up and I proceeded to tear it into pieces. The next target was one of my favorites. My trusty old woodblock – a great equalizer that stresses the entire length of the sword and hilt as one, not to mention a good indicator of how hard the blade is by examining the scuff marks left behind afterwards – and how deeply it ‘bites’. This test left me feeling VERY satisfied with the Knight sword. It bit into the wood as deep as a Katana, and showed very little in the way of scuffing. 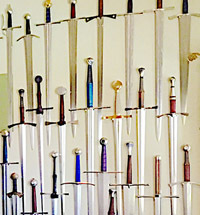 There was now little doubt in my mind that these swords were tempered to a Rockwell Hardness of 53 on the C scale! For effect, I thrust the blade deep into the supporting woodblock. And it went in so far that trying to remove it with force reminded me somewhat of King Arthur trying to pull Excalibur from the stone...! A what better way to do it with a severely damaging medium – a harsh side of a cinder block! The target was extremely heavy and thick. And if it didn’t break, the Knight sword probably would. At the very least, the impact would chew the sharpened edge up severely. "I was determined that something had to give!!" So a second strike found its target, and cleaved the block into two halves. Satisfied, I examined the edge and showed it off to the camera. Naturally, the edge was left with some marks where both impacts had connected. But the damage to the Knight sword was less than expected. 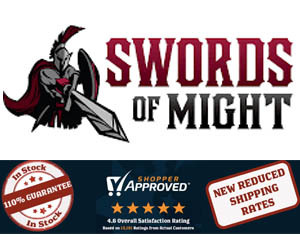 This Knight sword was proving to be one tough customer. And I was more than satisfied with its performance. 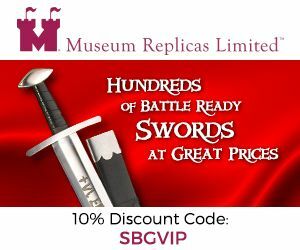 There was little doubt that these swords qualified for inclusion in the SBG Sword Store. They looked good, handled well and were as tough as old boots. Inspired by the destructive torture testing of Angus Trim and Albion swords on 44 and 55 Gallon Drums, I arranged for some of these monstrous things to be delivered to me and prepared the ultimate test. The drums looked much bigger than I expected. They were certainly bigger and meaner looking than the ones I had seen in the Albion Swords Destructive Testing pages. And the lip of the edge looked simply impossible to cut – after all, in the Albion tests – the blades for the most part simply impacted without really cutting – causing damage to the blade, but without rolling or completely deforming the edges. Yes, this was going to me a tough one. And I really had no idea what would happen. Protective gear on again – I proceeded with some thrusts, that penetrated into the side wall of the drums with no bowing of the blade or damage to the tip. Not amazingly deep, but deep enough – these drums were no push over..! The imposing looking lip of the drum was cut all the way through! And the sword, it was covered in some rust. But otherwise, barely any damage whatsoever. I lost count of how many times I cut and thrust into it. And towards the end, I felt the hilt loosen a little. But it was a simple matter of removing the pommel and tightening the nut to restore it back to normal. What more could I do?! I considered sticking the blade into the woodblock and taking an axe to it. That would surely destroy it...! But it did not seem to be a fitting end to this Knight sword, that had survived everything I had thrown at it – and still looked ready for more. I spent maybe 5 minutes polishing it. And it was apparent to me that with a little more work, it could be restored to as good as new! This is what it looks like after ALL the tests. You can barely even see the damage! 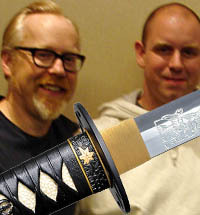 I am very glad that Jason Woodward brought these swords to my attention. 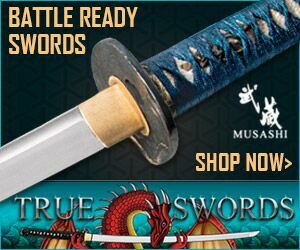 These swords are beautifully tempered and made from excellent steel. Even with a sharpened edge, they held against all manner of targets that would snap a regular sword clean in two..